We love our summer berries here in the Midwest: strawberries, raspberries, blueberries, black raspberries, currants and serviceberries. Juicy, rounded, brightly colored, sweet or sour, and many have pips or seeds, they’re perfect for jams, jellies, pies, tarts, muffins and cobblers. This versatile fruit is also easy to freeze and enjoy even when not in season. Berries make wonderful juices and wine and are used in some styles of beer and liqueurs. Nutritionally they’re high in anti-oxidants and fiber. Blueberries are a good source of vitamin C and vitamin K.
To freeze berries; sort, wash, dry on paper towels, place a layer of berries on a tray in the freezer for 2 hours. Transfer the frozen berries to a freezer bag or airtight container. Keep in the freezer for up to 6 months. 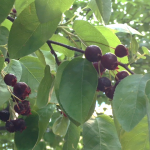 The less common serviceberries, sometimes called juneberries or saskatoons grow locally in Old Town and are foraged along the bike trail. Phil and Janet Graf pointed out they have a tree in their backyard. Serviceberries taste somewhat like a blueberry, strongly accented by the almond-like flavor of the seeds. 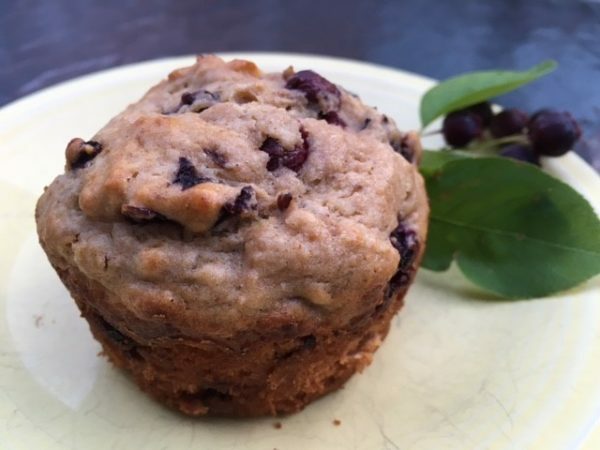 Good in pies, although a bit seedy, yet delicious, serviceberry jelly (seedless) and muffins are both a winners! Preheat the oven to 400°F. Lightly grease the cups of a standard muffin pan; or line with paper baking cups. Add egg, vanilla, vegetable oil, milk and berries. Stir to combine. Spoon the batter into the prepared muffin cups, filling them ¾ full. A slightly heaped muffin scoop of batter is the right amount. Remove the muffins from the oven, and after 5 minutes (or when they're cool enough to handle) transfer them to a rack to cool. Serve warm, or at room temperature. Store leftovers loosely wrapped at room temperature.